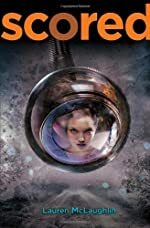 Review: When a book is set in the future, it can make the book interesting which is why Scored by Lauren McLaughlin is an outstanding book with some "abrasive" language and some odd twists and turns along the characters' paths. Imani, her friend Cady, their friends, and Imani's brother must do whatever it takes to raise their scores. In Scored , the main idea is based on the Score; a software program with "eyeballs" or cameras everywhere watching students' every move. The point of the program is to challenge students academically and give everyone a chance to go to college for free. Imani and her friend Cady were both 90's at one point (someone scoring a ninety or above means they'd receive a full scholarship and gifts from Score Corp., but someone dropping below 90 means their life would be absolutely hopeless), but Cady falls to a 70 jeopardizing her future. Before long, Cady lowers her score to a 27 and Imani's score dropped to a 64, with Cady jeopardizing both their futures for a drop-out, or as they'd say, "an unscored." They both seem to be in a doomed spiral. Will there be any way they can salvage their scores as well as their futures. There were many actions to lower a score such as doing badly in class, dating an unscored , or breaking Score Corp's rules. What made this book very intriguing was the way Lauren had put together the language (such as swearing and other coarse language) and made interesting characters (the characters seemed to have interesting personalities all different from another's) seem so realistic to anyone who reads this book. I give Scored a 5 out of 5 for its magnificent work, great situations, and voice. We would like to thank Random House for providing a copy of Scored for this review. Have you read Scored? How would you rate it? Hi, Sam P. I don't usually respond to my own reviews, as I prefer to allow my readers to discuss my books without any interference. But I just had to write to tell you how impressed I am with your review. I have always taken great pride in my own writing, but I never would have been capable of writing something as eloquent and sophisticated as your review when I was in 6th grade. Thanks for taking the time to review it. I'll be keeping my eyes open for more from you in the future.